One of eight children born to a wealthy, upper-class family; her father was a government minister. Educated by her family, tutors and at the local Salesian Sisters' school, she could play piano and violin, studied drawing, and loved to learn. At the age of twelve she spent a year extemely sick from rheumatic fever; she was paralyzed for six months and her heart was permanently damaged. She was cured by the intercession and apparition of Our Lady, Help of Christians, during which vision she understood her vocation to be a Salesian sister. On 8 December 1915, Maria joined the Marian Association's Daughters of Mary. She joined the Daughers of Mary, Help of Christians in 1920, and on 6 January 1929 in Nicaragua, Maria made her final profession as a Salesian. Transferred to San Jose, Costa Rica in 1931. Taught music, drawing and typing to rich school girls, trained catechists and trades to the poor. Many of her students were won over to her way of life, and worked with her to help the poor and abandoned. Maria developed a ministry of fund raising and of showing the wealthy practical ways to bring their charity to the poor. She began to set up recreational centers in 1945, and food distribution centers in 1953. She opened a school for poor girls in 1961, and 1966 a clinic staffed by volunteer doctors. In 1973 she organized the construction of seven homes, which became the foundation of the village of Centro San Jose, a community were poor families could have decent homes. An excellent teacher, manager and fund-raiser, she was known for her way of bringing God to people one on one, bringing love and devotion to the Eucharist to social improvements. Born a prince, the son of Saint Richard the King. Brother of Saint Winnebald of Heidenheim and Saint Walburga. Related to Saint Boniface. He nearly died as an infant, leading his parents to pray for his life, vowing that he would be dedicated to God if he survived. Entered the Abbey of Waltham, Hampshire, England at age five. Educated by Egwald. Benedictine monk. Pilgrim to Rome, Italy in 722 with Saint Richard and Saint Winnebald; his father died on the way, and Willibald suffered from malaria while there. Pilgrim to the Holy Lands in 724. He reached Jerusalem on 11 November 725, and is the first known Englishman in the Holy Land; the book of his travels, Hodoeporicon, is the first known English travelogue. Pilgrim to assorted holy sites throughout Europe. At one point he was arrested by Saracens at Emessa as a Christian spy, and imprisoned in Constantinople. Willibald then spent ten years helping Saint Petronax restore the monastery of Monte Cassino; served there as sacristan, dean, and porter. In 740 he was sent by Pope Gregory III to help Saint Boniface evangelize the area that is modern Germany. Ordained on 22 July 741 by Saint Boniface, and consecrated as a missionary bishop by him on 21 October 741. Founded a missionary monastery in Eichstätt, Franconia (in modern Germany. Worked with Saint Sebaldus. First bishop of the diocese of Eichstätt. With Saint Winnebald, he founded the double monastery at Hiedenheim in 752. He joined the Dominicans when a young man, and became 9th Master-General of his Order in 1296. Arranged an armistice between Philip IV of France and Edward I of England. Created Cardinal-Bishop of Ostia, Italy by Pope Boniface VIII. Papal legate. Defended Pope Boniface VIII against William of Nogaret and his allies. Unanimously chosen 194th pope in 1303. Removed papal censure from Philip and France, and absolved the cardinals favoring Colonna political faction. Accomplished a number of reforms in religious and clerical life. Believed to have been poisoned by the agents of William of Nogaret. Known for his lifelong devotion to Dominican spiritual practices. Author of a volume of sermons and commentaries on the Gospel of Matthew, the Psalms, the Book of Job, and Revelations. Son of Angelo To Puia, a village chief, and Maria la Tumul, an adult converts who were part of the region's first generation of Catholics. Peter was a pious boy, and though somewhat drawn to religious life, he became a lay catechist and worked with missionaries in the area. An excellent teacher and organizer of classes, he constantly carried and taught from his Bible. Married to Paula la Varpit on 11 November 1936. Father of three; one child died in infancy, another soon after the War. In 1942 all the missionaries and their staff were arrested by the invading Japanese armies, and were lodged in concentration camps. Peter continued to lead the faithful of his village as best he could, caring for the sick, Baptising and teaching the converts, helping the poor. When the War began to go against them, the Japanese began to repress the locals, forbidding Christianity, and pushing for a return to pre-Christian ways, particularly of polygamy. Peter opposed the regression, and was arrested in 1945 for conducting religious gatherings. Imprisoned in a cave, he was so well known, supported and beloved by those who knew him that he continued to be a source of strength to his people, and of annoyance to his captors. Martyr. Poor, uneducated but pious farmer, husband and father of eight children in 16th century England. Raised an Anglican, he converted to Catholicism. He was arrested on the day of his First Communion for the crime of converting. He was such a model prisoner that the jailers gave him keys so he could go out to work and return to serve his sentence. He used this as a way to get a priest, including Blessed Roger Dickenson, into the jail to minister to other Catholic prisoners. Arrested with Father Roger for the crimes of helping a priest, attending Mass and helping fellow Catholics during the persecutions of Queen Elizabeth I. He was given the chance for pardon if he would renounce Catholicism and attend a Protestant church; he declined. They brought his children to the jail in hopes of changing his mind; he gave them a father‘s blessing, and continued his preparation for execution. Martyr. One of seven children born to Modesto Pérez and Beatriz Mayo; his was a pious family, and Juan was baptized on 23 March 1908. Member of the Tarsicios, a religious association for children; at age 14 he started doing over-night Eucharistic adoration and started talking about becoming a missionary. Member of the Missionary Oblates of Mary Immaculate, making his first profession on 15 August 1927. Studied at the Pontifical University of Saint Thomas in Rome, Italy, made his perpetual vows in 1930, and was ordained on 26 June 1932. Worked in the Basque region in 1934, then in Madrid in 1935 where he taught philosophy. Arrested on 22 July 1936 by anti-Catholic forces fighting in the Spanish Civil War, he was imprisoned for a couple of days then martyred for his faith. Married layman in the apostolic vicariate of Southeastern Zhili, China. Father. Physician. An opium addiction led to him being forbidden to take Communion, and though he could not break his dependency for 30 years, he never lost his faith, never wanted to leave the Church, and when he was finally clean, he returned to full communion. Martyred in the Boxer Rebellion. Daughter of the king of East Angles. During her childhood, Ethelburga lived in a Gallic convent under the direction of Saint Burgundofara, a home she would have for the rest of her life. She was known throughout the community for her adherence to the Rule of the Order. In the mid-seventh century, Ethelburga was chosen abbess. She ruled with wisdom and justice until her death. Saint Tortgith of Barking was one of her nuns. Priest. Franciscan missionary bishop. Vicar apostolic for southern Hunan, China. One of the Martyrs of China, killed during the Boxer Rebellion. Founder and first Abbot of Tamalcht Abbey, County of Dublin, Ireland in 769 on land given by Donnchadh, King of Leinster. With Saint Aengus the Culdee he wrote the Rule of Célidhé Dé, "a minute series of rules for the regulation of the lives of the Célidhé Dé, their prayers, their preachings, their conversations, their confessions, their communions, their ablutions, their fastings, their abstinences, their relaxations, their sleep, their celebrations of the Mass, and so forth". Sulpician priest. Imprisoned on a ship in the harbor of Rochefort, France and left to die during the anti-Catholic persecutions of the French Revolution. One of the Martyrs of the Hulks of Rochefort. Priest at Saint John the Baptist Church, Fossano, Italy. Franciscan tertiary. Eventually resigned his parish and turned his house into a hospital. In 1396 he agreed to serve as director of the collegiate chapter in Fossano. Died while working with the sick during a plague epidemic. Priest. Member of the Missionary Oblates of Mary Immaculate. Martyr. Second century bishop of Brescia, Italy. 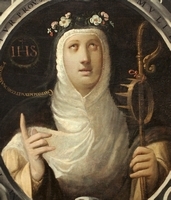 Baptized Saint Afra of Brescia. The Acts of Saints Faustinus and Jovita say that Apollonius was the bishop who ordained them. Nun of the Franciscan Missionaries of the Divine Motherhood. Martyred in the Spanish Civil War. Benedictine monk. Abbot at Whitby, Yorkshire, England. Bishop of the Wessex, England region in 676; he served for almost 40 years. Established his see at Dorchester, then Winchester. Adviser to King Ina. Known and praised for his learning, wisdom and holiness by may writers including Saint Jerome. Head of the Orthodox School in Alexandria, Egypt where Origen became a great teacher. Parish priest. Bishop of Genoa, Italy. Born to the Gallic nobility. Married. Mother. Widow. Helped found the abbey of Saint-Martin in Rauzeille near Aubusson, Creuse, Gaul (in modern France). Fled to Macedonia to escape the persecutions in Italy, but martyred en route. Fifth century spiritual student of Saint Guénolé at Landévennec abbey in Brittany. Abbot of Monte Cassino when the invading Lombards plundered and destroyed the monastery. Abbot of the monastery of Saint Gervase and Protase in Auxerre, France. Bishop of Auxerre. Related to Gallic royalty. Bishop of Vienne, France. Married layman who devoted himself to theology. Brother of Saint Medran. Disciple of Saint Kieran of Saghir. Venerated in Cornwall, England, but no information about his survived. Brother of Saint Odran. Disciple of Saint Kieran of Saghir.